For the first time, the tournament featured 16 teams. All ten full members qualified automatically, joined by the six associate members that qualified through the 2013 ICC World Twenty20 Qualifier. The qualifying teams are Ireland, Afghanistan, Netherlands and making their World Twenty20 debut the UAE, Nepal and Hong Kong. The first round consisted of 8 teams and 2 teams moved to next round. Second round was the Super 10 stage which consisted of 2 groups of 5 teams each. The top eight Full Member nations in the ICC T20I Championship rankings as of 8 October 2012 automatically progressed to the Super 10 stage of 2014 ICC World Twenty20. Joining the eight full members in the super 10 stage was host nation Bangladesh (also a full member) and associate nation The Netherlands who topped their first round group by net run rate ahead of Test playing nation Zimbabwe and Ireland. 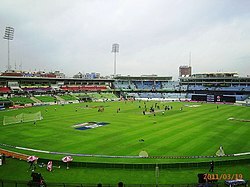 Thirty-one matches were played at three different venues in Dhaka, Chittagong and Sylhet. ^ "Men - Fixtures". ICC. Archived from the original on 23 February 2016. Retrieved 6 December 2013. ^ a b c "West Indies to start World T20 title defence against India". ICC. 27 October 2013. Archived from the original on 29 October 2013. Retrieved 27 October 2013. ^ "ICC World Twenty20(T20) 2014 Fixtures,Teams,News,Results,Points Table". NewsZoner. 21 March 2014. Retrieved 4 April 2014. ^ "Sri Lanka thrash India by six wickets to lift World T20 trophy". Times of India. 6 April 2014. ^ "World T20 2014". ESPNCricinfo. ^ "World Twenty20 2014: Format and points system explained". IBNLive. ^ "West Indies face India in World T20 opener". ICC. 27 October 2013. Archived from the original on 7 March 2016. Retrieved 24 February 2016. ^ "ICC World Twenty20 2014: India to open campaign against Pakistan at Mirpur". NDTV Sports. 27 October 2013. ^ a b "ICC ANNOUNCES MATCH OFFICIALS AND SCHEDULE FOR ICC WORLD T20 2014". International Cricket Council. Archived from the original on 16 March 2014. Retrieved 12 March 2014. ^ "ICC T20 World Cup 2014 Schedule". Archived from the original on 4 May 2014. ^ "ICC World Twenty20 Warm-up Matches, 2013/14". CricInfo. ESPN. Retrieved 3 March 2013. ^ "Logo for ICC World Twenty20 2014 Bangladesh launched in Dhaka". Cricket.com.pk. 6 April 2013. Archived from the original on 23 April 2013. Retrieved 8 April 2013. ^ "TV Broadcasters". icc-cricket.com. Archived from the original on 14 March 2014. Retrieved 14 March 2014. ^ "Radio Broadcasters". icc-cricket.com. Archived from the original on 14 March 2014. Retrieved 14 March 2014. ^ "ICC World Twenty20 Semifinals Exclusively on ESPN3, Final to be Telecast Live on ESPN2 in the U.S." ESPN press release. Retrieved 6 April 2014.